This Incident Report describes the extrajudicial killing of a family from Pee Ta Hka village tract, Paingkyon Township, Hpa-an District. Four members of a family were killed on June 11th 2013 by Border Guard Force (BGF) Battalion #1015 soldiers, after they accused the father of practicing black magic. This Incident Report was initially published in May 2014 in the Appendix of KHRG’s in-depth report, Truce or Transition? 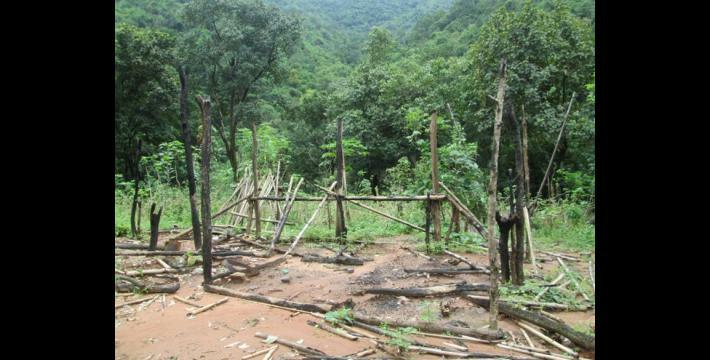 Trends in human rights abuse and local response in Southeast Myanmar since the 2012 ceasefire. The following Incident Report was written by a community member who has been trained by KHRG to monitor human rights abuses. It is presented below translated exactly as originally written, save for minor edits for clarity and security. This report was received in November 2013 along with other information from Hpa-an District, including one situation update and 121 photographs. I did not hear [know] about the incident at the time and I received the information during the last three months. When I heard about it, I immediately went to A--- village, asked the villagers and met with B--- [a villager from A--- village]. He told me about a group of victims. Many people said, “The father in that family is able to chant spiritual words." The BGF #1015 Commander Kya Aye heard that and said, “We should not keep alive someone who is able to chant spiritual words.” He [Commander Kya Aye] killed him and many other people. I know this information because an A--- villager told me about it. BGF soldiers told Saw B---, a villager from A--- village, who killed the necromancer. The [BGF soldiers] asked Saw B--- to bury the bodies [of the family]. Maybe these soldiers were absent-minded to let Saw B--- know [that they were responsible for the murder]. The information is a little bit more detailed, because one or two BGF #1015 soldiers are from Hteh Ra village and lived close to A--- village, and knew Saw B---. That is why we know that they [the BGF soldiers and Saw B---] trusted each other and dared to tell [the information]. Therefore, I believe this information to be the truth. This incident happened on June 11th 2013 at around 10:00 pm, at the side of A--- village, Pee Ta Hka village tract, Ta Kreh [Paingkyon] Township, Hpa-an District. There were four people in the family: (1) The father – Hpah Htay Poe, who was 60 years old; (2) The mother – Naw Muh, who was 55 years old; (3) The first daughter – Naw Tha Pweh, who was 28 years old; and (4) The second daughter – Naw Paw Hkler, who was 13 years old. Their village is called Ta Nay Traw (although they temporarily lived in A--- village), Ta Kreh Township, Hpa-an District. The BGF #1015 Commander Kya Aye asked his men [soldiers] to shoot and kill them all [the man accused of practicing witchcraft and his family]. BGF #1015 Commander Kya Aye said that Hpah Htay Poe [the father] could practice black magic and that he would be able to kill other people with his black magic, so he killed him, his wife and his two daughters. The BGF #1015 Commander, who lives in the Ya Ta BGF #1015 army camp, went to S--- village, Noh Hkwee village tract, Ta Kreh Township, Hpa-an District. He drove a red ‘tiger car’ with around ten of his men. He arrived in S--- [village] at around 3:00 pm. On June 11th 2013, they [the BGF soldiers] had a pork curry dinner together, with a pig that was about 20 kilos. After the meal, they planned to kill Hpah Htay Poe’s family members. He asked his six men to kill them, and two of his soldiers named Nyay Maw and Naw Kay accomplished the plan. Before they went, Commander Kya Aye told his men, “Don’t question anything, just kill them all. If you leave any of them alive, they will keep on killing other people with their [black magic].” So the BGF #1015 soldiers killed Hpah Htay Poe, his wife and his daughters. This family used to live in Ta Nay Traw village, Meh Pra village tract, Ta Kreh Township, Hpa-an District. When the DKBA [Democratic Karen Benevolent Army] was formed during the war, they moved temporarily [from Ta Nay Traw village] to the A--- side of the village and then they lived in A--- village at the eastern part of the riverside called E---. They had lived there for over 20 years already. The KNU [Karen National Union], the KNLA-PC [Karen National Liberation Army/Karen National Union-Peace Council] knew [about the assassination], but they did not have any proof, so none of those armed groups dared to do anything. They just heard people say that, “Hpah Htay Poe can kill people with his witchcraft.” No one knew exactly if the people who had been killed were able to kill people with their witchcraft. When the BGF #1015 soldiers arrived at Hpah Htay Poe’s hut, they told Hpah Htay Poe to come down [the ladder of] his house and they shot him in his chest. He [Hpah Htay Poe] was dead before he climbed down the ladder. Then they called Naw Muh and her two daughters to come down and [after the family did], they [the soldiers] shot and killed them [the family] all at the same time. 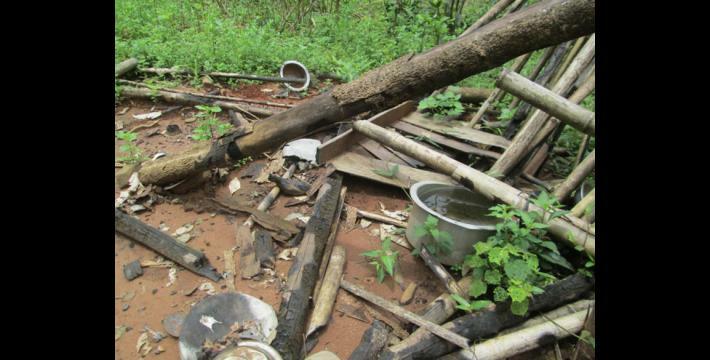 After that, they pulled down Hpah Htay Poe’s dead body from the hut. They searched his hut and they found two golden necklaces and some Myanmar money. After that, they burned down the whole hut. Regarding all of this information: we knew [about what happened] when BGF #1015 soldiers returned and told A--- villager, Saw B---, what had happened. His [Saw B---’s] village was close [to the village where the incident occurred] and they [the BGF soldiers and Saw B---] knew each other. The BGF soldiers also asked Saw B--- to bury the dead bodies [of the four persons] that they had killed. 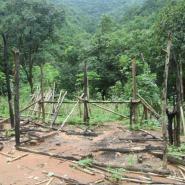 After one and a half days, the A--- villagers buried the dead bodies of Hpah Htay Poe’s family. These six BGF #1015 soldiers fulfilled the order completely. They gave the two golden necklaces and the Myanmar money that they brought to their commander, but the commander did not accept those things. I know that he gave those things to his soldiers who went [fulfilled the order]. 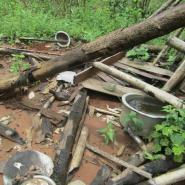 When I took the [below] photos, I was standing next to Hpah Htay Poe’s hut at his grave. I also mentioned the date [in the photo set] when the photos were taken. The district leader asked me for some photos, so I had to give him some photos. I gave him only five photos and kept all the remaining photos for KHRG. There were two sets of photos: (1) the hut and compound that was burned down, and (2) the grave where the dead bodies were buried. I took the photos on the 1st of October 2013, when I went along with a A--- villager called Saw B--- to take the photos. Finally, Hpah Htay Poe’s [third] daughter got married, and she is currently living in Brigade #6 [Dooplaya District] at the side of K--- [area]. I heard that she was looking for ways to get help after what had been done to her parents and siblings. Because she lives far away from me, it is not easy for us to meet each other. I cannot say exactly what her opinion is about that case and whether [action will be taken] in the future. Because the victims’ daughter is not living close to the place that the accident happened, I think we can use and mention [publish] the information as necessary. KHRG Incident Reports are written or gathered by a community member in Hpa-an District who has been trained by KHRG to monitor human rights conditions. KHRG trains community members in eastern Burma to document individual incidents of abuse using a standardised reporting format; conduct interviews with other villagers; and write general updates on the situation in areas with which they are familiar. When writing incident reports, community members are encouraged to document incidents of abuse that they consider to be important, by verifying information from multiple sources, assessing for potential biases and comparing to local trends. This is the Karen translation [expression] for someone who practices necromancy.